I am a traditional Libra, which means finding balance is a necessity. I thrive when I am being active and find the most harmony when my schedule (and life) feels organized and in order. Because of that I have spent a lot of time (especially over the past few years, since I’ve had my brand tréStiQue) prioritizing what means the most to me. Running your own brand and balancing time for your family, friends and the things that make you feel the most like you (for me, that is eating healthy and working out) can often seem impossible, but I have found that when even one of these aspects of my life feels like it is not getting the attention it deserves, everything else also starts to feel out of whack. I often feel as a working mom that there is so much weight on my shoulders. I want to see my child grow up and be there for all of his big (and daily) milestones, but I also want my company to succeed and flourish (and want to do whatever I can to make that happen). So, in other words, being a Libra is a blessing and a curse! Finding balance is actually one of the reasons I created tréStiQue to start with. I love makeup and have worked in this industry my entire career, but often felt like the amount of time it took to do a full routine was not realistic for the everyday busy woman. I have always been a busy body, and I wanted my makeup to be able to keep up with me (and go with me wherever I needed it to). So, I decided to create it! And now my routine takes 5 minutes to put on, is made up of makeup crayons that have built-in tools to apply it (so super easy to do on-the-go) and it all fits in a small lightweight bag that is the size of a coffee cup and is easy to carry. At the end of the day, if I can help simplify your daily to-do list, then I have done my job well. Finding balance is something I have to do to stay sane, and because of that I wanted to share how I have done it among the chaos. I would love to hear if you relate to any of this and if there are other things that help keep you zen! Family: My family is the most important thing to me in the world. A few years ago I decided to leave my corporate job, invest my life savings and start my own company. The reason I left is because I wanted to create something that had significant meaning to me while also allowing myself to be a more present mom and wife. It has been the scariest and most rewarding thing I have ever done. I work really hard to try and figure out the best way to balance my job and my personal life. I start by being home for dinner and bedtime every night (it is my favorite part of every day and I really try not to miss it!). I also decided I was going to work from home every Friday. I love being a part of my son Romi’s daily activities and truly feel happy and relaxed (which is saying a lot with a 1 ½ year old!) when I take him to a class, make him lunch or put him down for his nap. I also make family time on the weekends a priority. I try to put down my phone and computer as much as possible, so I can just be with my family. Since I started tréStiQue (and since we had our son) my husband and I make sure that we have at least one date night a week. We often end up at our favorite restaurant down the street and spend the time eating delicious food and catching up on all the big things that have happened. We also plan two family trips a year. Since we both run our own companies we often have to work throughout these trips, but we always make time each day to experience and see the world. Work: This is a tough one because creating and running a start-up is pretty much the oxymoron to “balance,” there is no such thing. The way I have managed to keep order to it all is to allocate time with everyone at my company every week. I set meetings with each department regularly and want everyone to know they (and their projects) are a priority. I also make time to focus not only on the small daily details but also the full picture, and I take a few moments every day to sit in my office and create lists (I love order!) so I know who/what needs the most attention. I have found this helps me prioritize my schedule and also allows us to continually move forward and grow. Managing a team has been one of the biggest challenges of starting my own business, and I feel like I am constantly learning new ways to work with people. When you run a company, you decide who is going to be part of your “work family” – and it is up to you to create the culture from scratch. I am lucky to have a great team that is both passionate and hardworking. Personal: I find balance when I exercise and take care of myself. The more workouts I can squeeze in the better! After I workout I always feel energized, rejuvenated and relaxed. My brain feels clear and ready to take on whatever is up next. I grew up on an organic farm so eating healthy, fresh food is also a huge part of my life. I love cooking and truly find peace walking around the farmer’s market and gathering my weekly groceries. On the weekends I also love to treat myself to a massage or just take time to soak in my bathtub (naturopathica peppermint flakes are my personal favorite) listening to classical guitar musical. And because carving out time for my friends in a must, there is nothing that sounds more relaxing than sitting outside on a NY summer night sipping rosé (or the occasional glass of tequila) with my favorite people. 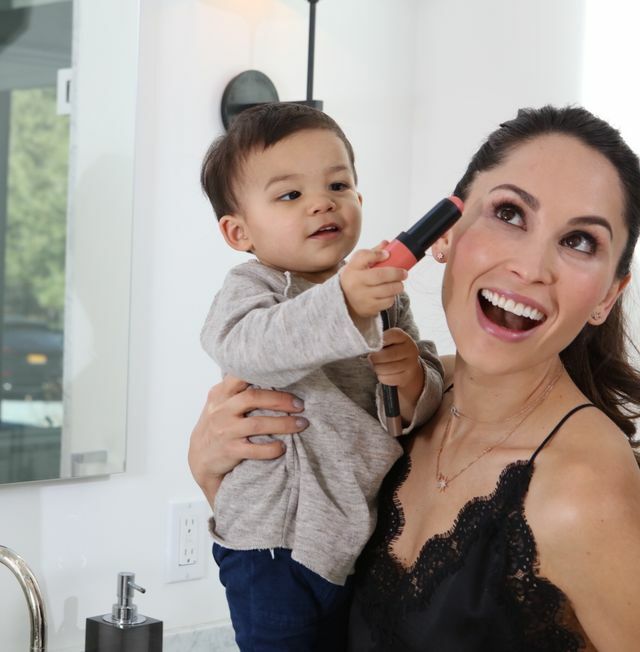 A busy working NYC mom (of one, 20-month-old boy) who was always traveling, co-founder Jenn Kapahi wanted to find a quicker, easier everyday makeup routine that would allow her to get ready in 5 minutes, anytime and anywhere. Although a beauty expert, Jenn was not able to find any brand that provided a complete routine that was easy to use and easy to carry. She’s a visionary, she’a passionate product developer with 12+ years of industry experience, including sales, marketing, trend & product development. Jenn began as a makeup artist training with Clinique and graduated the Executive Training Program at Bloomingdales. At Intercos, Jenn managed sales, trend and marketing efforts across the mass, prestige and specialty brand clients. At Revlon, she led global product development for the lip, nail & trend categories. Jenn has a BA from Skidmore College in studio art.